Read here about a proposed pavilion constructed according to tensegrity principles, by architecture students as part of their architecture schooling. 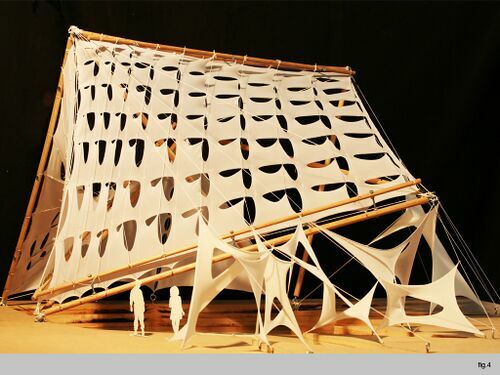 Complete Model of Para-Tensegrity Pavilion Concept, with shade membranes." 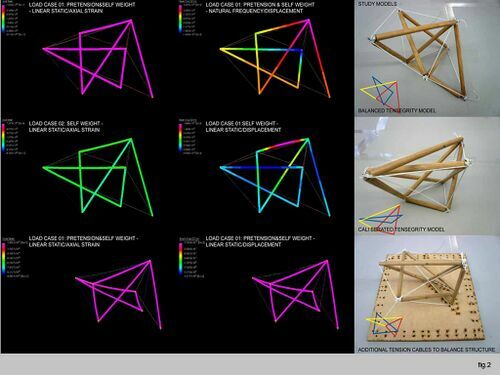 Guangyuan Li, Merate Barakat, Sebastian Nau, Sevinj Keyaniyan created the Para-Tensegrity pavilion concept in 2010. The work is published on the school's website. Tensegrity Pavilion The main structure of the Para- Tensegrity pavilion initially began by studying different configurations of compression and tension members. Following the initial form delineation the angles and lengths of the members were parametrically attuned to accommodate the program (sight lines, headroom, and spatial articulation). Substructure members are fixed to the main compression members. These members work in sync with the main compression and tension members to support the tensile shading system. The landscape tensile systems are supported by secondary tensile cables spanning from the main structure to the surrounding landscape. Moreover, the forum screens are supported by the main structural members. Fabrication of the shading system proved to have more issues than the main structure assembly. Even though the structural analyses where based on steel members, the physical model was built in wood. This resulted that in the buckling of the longer members when the shading tensile system was applied. The mapping and the tools used to cut the openings were not entirely successful; which is apparent in the fraying of the opening edges. 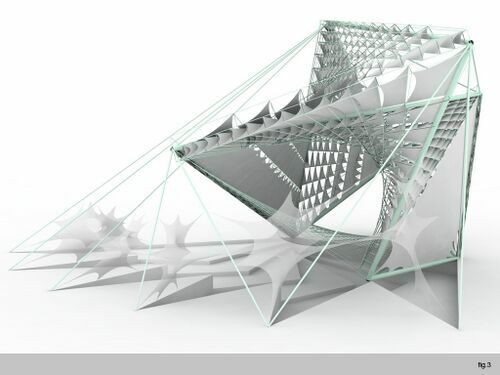 The Para-Tensegrity pavilion inherited from its ancestors a few preliminary schemes; packing of the smallest possible geometry, parametric response to the environment, and form finding. These schemes are the basis of the main structure, the substructure, and the landscape/ shading/ screen tensile systems. Load analysis in software and physical models." 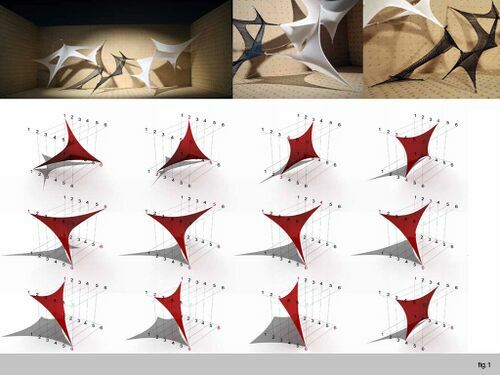 Shade membrane configurations and explorations.."
Computer rendered possible model of Para-Tensegrity Pavilion Concept." This page was last edited on 6 January 2019, at 07:32.